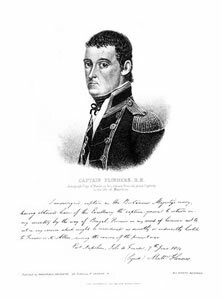 "I undersigned, Captain in his Britannic Majesty's Navy, having obtained leave of his Excellency the Captain-General to return in my Country by the way of Bengal, promise on my word of honour not to act in any Service which might be considered as directly or indirectly hostile to France or its Allies, during the Course of the present War. Port Napoleon, Isle of France, 7th June, 1810. (Signed) Mattw. Flinders"